You Are Here: Home → Analysis | Mike Fisher&apos;s best position? Locker room leader. Analysis | Mike Fisher&apos;s best position? Locker room leader. Nashville Predators captain Mike Fisher has retired from the NHL after 17 season. Joe Rexrode and Dave Ammenheuser discuss what this means for the team. This is a great and well-deserved week for Mike Fisher, finishing a successful hockey career on his terms. It’s a bad week for his former team. 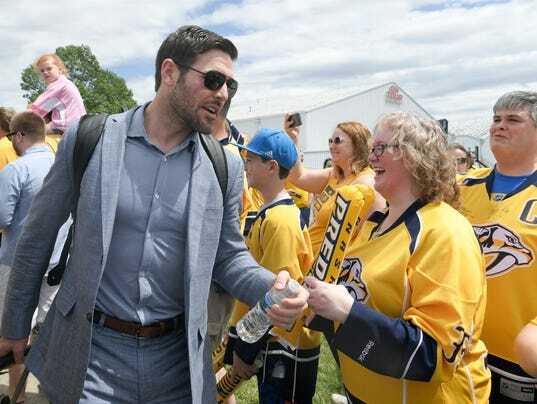 The Nashville Predators will remember the good times with Fisher, who is retiring at age 37 after six-plus seasons with them and 17 in the NHL, as they should. And when they get back to business with training camp starting next month – next month! – they will do so with a reduced chance of returning to the Stanley Cup Final.